Category 4 Hurricane Florence Threatens US With "Catastrophic Flooding"
The National Hurricane Center said the Atlantic hurricane threatening the southeastern United States has "continued to rapidly strengthen." Hurricane Florence intensified on Monday into a Category 4 storm, the second-highest on the five-level scale, US forecasters said. 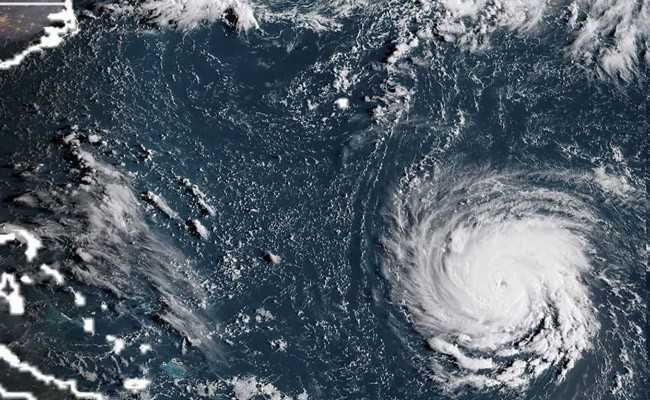 Florence was 580 miles (935 kilometers) south-southeast of Bermuda and the center of the storm was forecast to pass between Bermuda and the Bahamas on Tuesday and Wednesday, the NHC said. Hurricane Florence has the potential to bring catastrophic flooding to areas of the eastern United States already soaked by heavy rain. On its current track, Florence is expected to slam the Carolinas and Virginia the hardest -- and all three states have issued emergency declarations to speed preparations. Virginia Governor Ralph Northam's office described Florence as possibly the state's "most significant hurricane event in decades," and warned of "catastrophic inland flooding, high winds and possible widespread power outages." "The largest threat to life from hurricanes is not the high winds," it said. "Flooding is the deadliest result of these storms." The US Navy ordered ships at its major base in Hampton Roads, Virginia, to put to sea, saying "the forecasted destructive winds and tidal surge are too great to keep the ships in port." The storm "is too powerful and its path is too uncertain to take any chances," South Carolina Governor Henry McMaster said, issuing his state's emergency declaration. Helene -- 375 miles west of the Cape Verde islands off the African coast -- had winds up to 105 mph, and was expected to continue moving west-northwest for another couple of days, the NHC said in its 1500 GMT bulletin. At 1500 GMT, Isaac, which the NHC called a small hurricane, was about 1,150 miles east of the Windward Islands -- a region still recovering from last year's powerful Hurricane Maria -- with maximum sustained winds near 75 mph.